Back to the Future: Cinemagraphs are here to stay! Cinemagraphs are more than just a pretty fad – they’re changing advertising as we know it! In this week’s blogpost we take a quick journey into the future and predict which industries will be disrupted by living photos. Tech trends change so fast that it’s hard to discern which technologies will become a fixture of our lives and what’s just a passing craze (Vine, we hardly knew ye!). Going back a few years, most attempts to forecast technological innovations have either been disappointing – #wheresmyhoverboard – or are laughably dated. Now however, we’re living in an exceptionally tech-savvy age which makes it easier to make educated guesses about what’s to come. Real-world display advertising for example, is highly likely to rapidly become cheaper, more refined and easier to produce. The kind of ads that we’re used to online will become an integral part of our physical realities. Living photos are already establishing themselves as a strong alternative to the static image and cinemagraphs will offer a range of industries a unique and futuristic way to reach their target markets. Here’s an advance look at how this future will benefit prominent industries. We all have that one friend who suffers badly from food envy. No matter how delectable their order, once the food arrives, all they want is what’s now in front of their friend. Imagine how much easier their lives would be if menus gave them an accurate preview of how each dish would look! Personally, I’m always turned off by food photographs on menus which most often make dishes look cold and unappetising. Cinemagraphs solve this problem. The same principle can be applied to other sectors of the food industry. 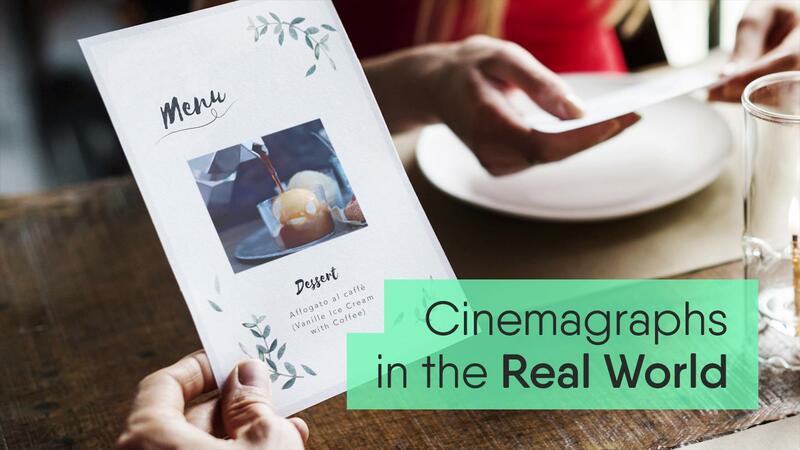 Supermarkets, too, can benefit by using cinemagraphs to make products look more attractive and tangible, and foodies who like rustling up their own creations at home can have a more fun experience with cinemagraph cookbooks. Travel is one of the great luxuries of the modern age. However, with the sheer volume of people on the move and security concerns at an all-time high, lines for passport control seem to keep getting longer. Spare a thought for the overworked border control officer. In the near future, cinemagraphs could be integrated into ID cards providing a more realistic facial structure, speeding up recognition, and making passports less susceptible to fraud. Once on board the plane, cinemagraph flight safety cards could save the flight attendants time and make the information more engaging and easier to follow. For those who aren’t sure where to go next, cinemagraphs could inspire their next holiday. Travel agents could entice customers towards certain destinations by giving them a more tangible sense of place in advance of their trip, via digital billboards and video walls. Fashion has always been at the forefront of advertising innovation and has never shied away from finding new ways to strut its stuff. Cinemagraphs have the capacity to revolutionise in-store merchandising and to make shop floor displays far more versatile. And sales people aren’t the only ones who stand to benefit. Models spend large portions of their lives going to castings and sending off hefty portfolios. Getting a sense of a person can be hard just through static photographs, and it’s also difficult to judge how photogenic someone is just from one meeting. Cinemagraph portfolios give a sense of the living person while still retaining static elements used in more traditional photos. Designers too can convey a sense of movement in their clothing that they might struggle to get across in a still photo. These are just a few examples of the manifold ways that diverse industries can benefit from cinemagraphs, not just online, but in the physical world. Integrating cinemagraphs into your company’s marketing strategy may seem futuristic but it’s a sure-fire way to add something special to your campaigns. Why not embrace the future now and start using cinemagraphs to set your company apart? Don’t be shy about blazing a trail – where you’re going, you don’t need roads! Don’t want to wait until Apple invents printable screens to use cinemagraphs? You don’t have to! Check out THIS blogpost for ideas on how your business can start using cinemagraphs right away! I'm Carrie, an Irish writer and editorial consultant based in Berlin. As a former digital marketer, I love how cinemagraphs can effortlessly capture attention, communicate real value, and be simply beautiful. When I'm off the clock I can usually be found reading, writing, or having an over-caffeinated wander around. I also occasionally run a Bad Movie Night where we delight in poorly-orchestrated b-movies.